HARMAN delivers the world's most captivating Esports experiences by ensuring that every gamer or guest enjoys themselves to the point of automatically planning their return. A cohesive infrastructure of audio, video, lighting, broadcasting, restaurant, bar, and retail solutions creates a second to none visitor experience and countless recurring ROI. Restaurants, bars, and gaming stations offer visitors the ability to enjoy food, drink, conversation, and gaming in between events without needing to leave the venue. HARMAN has a range of solutions designed to showcase menus, entertain guests, deliver information and cross- and up-sell food, beverages and merchandise to support guests and drive additional revenue. Capturing and broadcasting Esports competitions is often just as important as execution of live views, requiring operators and equipment to make changes and adjustments very quickly. With HARMAN’s Studer all-in-one consoles and routing solutions, broadcasts run seamlessly to adapt to unexpected changes. Suites are where Esports stadiums and arenas cater to their VIP clients. HARMAN’s innovative suite solutions envelop visitors with a luxurious ambience of integrated touch panels for on demand services and the best audiovisual and lighting experiences to entertain and excite friends, families and clients. Training rooms and backstage areas allow players to practice, rest, and reconnect before and after competition. With HARMAN audio solutions, video distribution, and signage solutions, venue owners can provide players with a comfortable and engaging atmosphere they’ll look forward to re-experience. The broadcast world is ever-changing, whether due to an Esports event moving to a new city or due to shifts in the technology landscape itself. HARMAN’s OB truck technologies provide the ultimate in flexibility and future-proofing to ensure the perfect broadcast solution for any situation. The floor and its showcase stages anchor the action in any Esports venue. With legendary and industry leading audio, video, and dynamic lighting solutions, HARMAN has the experience to capture, illuminate, and deliver the action to ensure players and in-game activity can be seen and heard from any seat in the house. Each guest will spend a significant amount of time traversing the concourse visiting retail shops and restrooms. HARMAN’s technology solutions engage guests with background music, visuals, and lighting to set a tone that ensures they stay longer and return again and again. The world’s biggest performers trust HARMAN sound mixing, video distribution, and lighting control technology show after show. They know only HARMAN can deliver the level of consistent and reliable support they demand to guarantee show-stopping competitions, night after night. An Esports stadium or arena exterior makes a lasting statement, permanently changing the city skyline and impacting gamers & guests long before they even walk through the door. HARMAN architectural lighting and media façade solutions transform buildings into powerful performance and entertainment centers. HARMAN Professional has everything needed to support the wide range of Esports venue requirements. 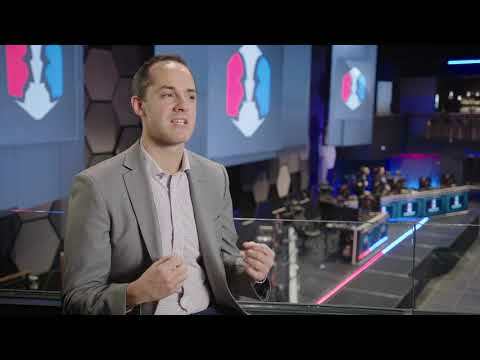 From delivering a complete audio, video, and lighting competition experience to ensuring impeccable guest experiences throughout the building, HARMAN has the ideal Esports solution for every venue. HARMAN technologies bring Esports venues alive and ensure every gamer and guest is immersed in a unique experience. HARMAN Professional Solutions has partnered with Allied Esports to provide a world-class audiovisual experience at the new arena.